Stupid, sadistic and absolutely no fun whatsoever, the relentlessly dreary "Batman v Superman: Dawn of Justice" offers further proof that every 21st-century Warner Bros. movie featuring those characters seems doomed to be dark, depressing and don't-drag-a-date-along dismal. Like "Superman Returns," "Man of Steel" and the "Dark Knight" trilogy, this latest example of joyless, heavy-handed brutality is nothing but a bad time. None of those Warner Bros. movies ever could be mistaken for the more colorful, clever and character-driven Marvel superhero flicks ("The Avengers," "Iron Man," "Captain America," "Thor," et al). But that different-as-night-and-day distinction is no virtue when the alternatives WB offers are so off-puttingly miserable that they substitute boringly operatic overkill for engagingly amusing adventure. 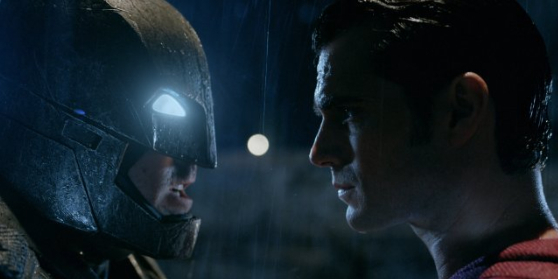 Dreadfully dark in both senses of the term, "Batman v Superman" spends its first half setting up a tiresomely dumb plot that depends upon pissed-off and permanently dyspeptic-looking Bruce Wayne/Batman (Ben Affleck, mistaking beard stubble for method acting) somehow missing the point that Superman (the forgettably blank-faced Henry Cavill) saved the planet in "Man of Steel." Instead, he regards Superman as potentially the same sort of incredibly powerful enemy as the very nasty gang of fellow Kryptonians that Supes dispatched last time around. Granted, a lot of Metropolis was laid waste in that battle, which never would have occurred if Superman hadn't arrived on Earth. But Wayne's unreasonable resentment smacks more of childish jealousy than believable concern for humanity's welfare. Likewise, Batman's eventual intention to outright murder Superman, after receiving some taunting hate mail that even a fifth-grader could figure out was fake, makes one wonder if a bit of moron-producing inbreeding went on in the Wayne family. Also, Superman and Batman both should realize a lot sooner that annoyingly twitchy psycho-genius Lex Luthor (Jesse Eisenberg, doing Mark Zuckerberg with a slightly worse attitude and bad hair) is up to no good. Yet somehow Superman never bothers keeping an eye on a crashed Kryptonian ship in the middle of Metropolis to which Luthor gains access for nefarious purposes, or another one in the Indian Ocean that went down carrying a cache of kryptonite. Meanwhile, Batman apparently can't simply Google the puzzling term "White Portuguese" to discover that it's the name of a ship carrying questionable cargo. Admittedly, lots of suspension of disbelief is required for any superhero flick, but the premise of a fight involving one contender who literally is faster than a speeding bullet is preposterous from the get-go. When the big throw-down arrives, it's impossible to believe that Superman (who earlier has flown from Metropolis to Mexico in minutes at the most) wouldn't completely disarm and restrain Batman in the blink of an eye, then calmly clear up the contrived misunderstanding that brought them to that point. Where Snyder's adaptation of the classic "Watchmen" comics merited some grim seriousness, that approach here comes across as pompous, ponderous and irritatingly pretentious. The bombastically aggravating score by Hans Zimmer and Junkie XL doesn't help, although its deafening omnipresence may help keep audiences awake. The best that can be said about Gal Gadot's Diana Prince/Wonder Woman, who resembles a skinny Kardashian and has the same otherworldly air of exotic vacuity, is that she isn't onscreen long enough to wear out her welcome. She's beautiful and gives good crotch-shot, but is that all there is? The interminable screenplay (by Chris Terrio and David S. Goyer) also includes bits about other heroes who will team up in next year's Justice League movie by offering very brief glimpses of Aquaman, Cyborg and The Flash. Unfortunately, the prospect of taking another tedious excursion into this ugly, vicious universe feels more like a warning than an invitation. 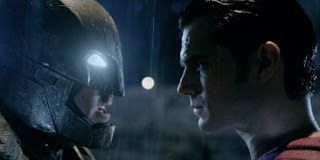 Although "Batman v Superman: Dawn of Justice" has a PG-13 rating, be advised that it probably is best enjoyed by the variety of violence-obsessed sociopath who thinks Superman got off too lightly by taking only a dagger to the liver during his comparatively more genteel beatdown in "Superman Returns." A frustrating failure on every level, this is one comic-book movie that definitely isn't for kids. Sadly, it also isn't appropriate for most adults. Although Lex Luthor might like it.